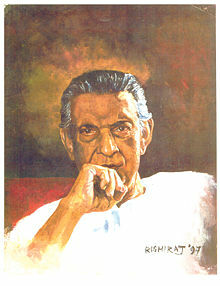 Satyajit Ray (2 May 1921-23 April 1992) was a Bengali Indian filmmaker. He is regarded as one of the greatest auteurs of 20th century cinema. Born in the city of Kolkata (then known as Calcutta in English, though Kolkata in Bengali) into a Bengali family prominent in the world of arts and letters, Ray studied at Presidency College and at the Visva-Bharati University. Starting his career as a commercial artist, Ray was drawn into filmmaking after meeting French filmmaker Jean Renoir and viewing the Italian neorealist film Bicycle Thieves during a visit to London. Ray directed thirty-seven films, including feature films, documentaries and shorts. Ray's first film, Pather Panchali, won eleven international prizes, including Best Human Document at Cannes film festival. Along with Aparajito and Apur Sansar, the film forms the Apu trilogy. Ray did scripting, casting, scoring, cinematography, art direction, editing and designed his own credit titles and publicity material. He was a fiction writer, publisher, illustrator, graphic designer and film critic. Ray received many major awards, including an Academy Honorary Award in 1992. Satyajit Ray's ancestry can be traced back at least ten generations. Ray's grandfather, Upendrakishore Raychowdhury was a writer, illustrator, philosopher, publisher, an amateur astronomer, and a leader of the Brahmo Samaj, a religious and social movement in nineteenth century Bengal. Sukumar Ray, Upendrakishore's son, was a pioneering Bengali writer of nonsense rhyme and children's literature, an illustrator and a critic. Ray was born to Sukumar and Suprabha Ray in Kolkata. Sukumar Ray died when Satyajit was barely three, and the family survived on Suprabha Ray's meager income. Ray studied economics at Presidency College in Kolkata, though his interest was always in fine arts. In 1940, his mother insisted that he study at the Visva-Bharati University at Santiniketan, founded by Rabindranath Tagore. Ray was reluctant due to his love of Kolkata, and general low impression about the intellectual life at Santiniketan. His mother's persuasion and his respect for Tagore finally convinced him to try this route. In Santiniketan, Ray came to appreciate oriental art. He later admitted that he learnt much from the famous painters Nandalal Bose and Benode Behari Mukherjee on whom Ray later produced a documentary film, "The Inner Eye". With visits to Ajanta, Ellora and Elephanta, Ray developed an admiration for Indian art.Ray left Santiniketan in 1943 before completing the five-year course and returned to Kolkata, where he took a job with a British advertising agency, D.J. Keymer. He joined as a "junior visualiser", earning just eighty rupees a month. Although on one hand, visual design was something close to Ray's heart and, for the most part, he was treated well, there was palpable tension between the British and Indian employees of the firm (the former were much better paid), and Ray felt that "the clients were generally stupid". Around 1943, Ray became involved with Signet Press, a new publishing house started up by D. K. Gupta. Gupta asked Ray to create cover designs for books published from Signet Press and gave him complete artistic freedom. Ray designed covers for many books, including Jim Corbett's Maneaters of Kumaon, and Jawaharlal Nehru's Discovery of India. He also worked on a children's version of Pather Panchali, a classic Bengali novel by Bibhutibhushan Bandopadhyay, renamed as Am Antir Bhepu (The mango-seed whistle). Ray was deeply influenced by the work, which became the subject of his first film. In addition to designing the cover, he illustrated the book; many of his illustrations ultimately found their place as shots in his groundbreaking film. Along with Chidananda Dasgupta and others, Ray founded the Calcutta Film Society in 1947, through which he was exposed to many foreign films. He befriended the American GIs stationed in Kolkata during World War II, who would inform him of the latest American films showing in the city. He came to know a RAF employee, Norman Clare, who shared Ray's passion of films, chess and western classical music. In 1949, Ray married Bijoya Das, his first cousin and longtime sweetheart. The couple had a son, Sandip, who is now a film director. In the same year, Jean Renoir came to Kolkata to shoot his film The River. Ray helped him to find locations in the countryside. It was then that Ray told Renoir about his idea of filming Pather Panchali, which had been on his mind for some time, and Renoir encouraged him to proceed. In 1950, Ray was sent to London by D.J. Keymer to work at its head office. During his three months in London, he watched 99 films. Among these was the neorealist film Ladri di biciclette Bicycle Thieves (1948) by Vittorio De Sica which had a profound impact on him. Ray later said that he came out of the theater determined to become a filmmaker. Ray during his years at Santiniketan. Ray had now decided that Pather Panchali, the classic bildungsroman of Bengali literature, published in 1928 by Bibhutibhusan Bandopadhyay, would be the subject matter for his first film. This semi-autobiographical novel describes the growing up of Apu, a small boy in a Bengal village. Ray gathered an inexperienced crew, although both his cameraman Subrata Mitra and art director Bansi Chandragupta went on to achieve great acclaim. The cast consisted of mostly amateur artists. Shooting started in late 1952, using Ray's personal savings. He had hoped once the initial shots had been completed, he would be able to obtain funds to support the project; however, such funding was not forthcoming. Pather Panchali was shot over the unusually long period of three years, because shooting was possible only from time to time, when Ray or production manager Anil Chowdhury could arrange further money. With a loan from the West Bengal government, the film was finally completed and released in 1955 to great critical and popular success, sweeping up numerous prizes and having long runs in both India and abroad. During the making of the film, Ray refused funding from sources who demanded a change in script or the supervision of the producer, and ignored advice from the government (which finally funded the film anyway) to incorporate a happy ending in having Apu's family join a "development project". Even greater help than Renoir's encouragement occurred when Ray showed a sequence to John Huston who was in India scouting locations for The Man Who Would Be King. The sequence is the remarkable vision Apu and his sister have of the train running through the countryside. It was the only sequence Ray had filmed due to his small budget. Huston notified Monroe Wheeler at the New York Museum of Modern Art that a major talent was on the horizon. In India, the reaction to the film was enthusiastic, The Times of India wrote that "It is absurd to compare it with any other Indian cinema Pather Panchali is pure cinema". In the United Kingdom, Lindsay Anderson wrote a glowing review of the film.However, the reaction was not uniformly positive. After watching the movie, François Truffaut is reported to have said, "I don't want to see a movie of peasants eating with their hands." Bosley Crowther, then the most influential critic of The New York Times, wrote a scathing review of the film that its distributor Ed Harrison thought would kill off the film when it got released in the United States, but instead it enjoyed an exceptionally long run. Ray's international career started in earnest after the success of his next film, Aparajito (The Unvanquished). This film shows the eternal struggle between the ambitions of a young man, Apu, and the mother who loves him. Many critics, notably Mrinal Sen and Ritwik Ghatak, rank it even higher than the first film. Aparajito won the Golden Lion in Venice. Before the completion of the Apu Trilogy, Ray completed two other films. The first is the comic Parash Pathar (The Philosopher's Stone), which was followed by Jalsaghar (The Music Room), a film about the decadence of the Zamindars, considered one of his most important works. Ray had not thought about a trilogy while making Aparajito, and it occurred to him only after being asked about the idea in Venice. The final installation of the series, Apur Sansar (The World of Apu) was made in 1959. Just like the two previous films, a number of critics find this to be the supreme achievement of the trilogy (Robin Wood, Aparna Sen). Ray introduced two of his favourite actors Soumitra Chatterjee and Sharmila Tagore in this film. The film finds Apu living in a nondescript Kolkata house in near-poverty. He becomes involved in an unusual marriage with Aparna, the scenes of their life together forming "one of the cinema's classic affirmative depiction of married life", but tragedy ensues. After Apur Sansar was harshly criticised by a Bengali critic, Ray wrote an article defending it-a rare event in Ray's film making career (the other major instance involved the film Charulata, Ray's personal favourite). His success had little influence on his personal life in the years to come. Ray continued to live with his mother, uncle and other members of his extended family in a rented house. During this period, Ray composed films on the British Raj period (such as Devi), a documentary on Tagore, a comic film (Mahapurush) and his first film from an original screenplay (Kanchenjungha). He also made a series of films that, taken together, are considered by critics among the most deeply felt portrayal of Indian women on screen. Ray followed Apur Sansar with Devi (The Goddess), a film in which are studied the superstitions in the Hindu society. Sharmila Tagore starred as Doyamoyee, a young wife who is deified by her father-in-law. Ray was worried that the censor board might block his film, or at least make him re-cut it, but Devi was spared. In 1961, on the insistence of Prime-minister Jawaharlal Nehru, Ray was commissioned to make a documentary on Rabindranath Tagore, on the occasion of the poet's birth centennial, a tribute to the person who probably influenced Ray most. Due to limited real footage of Tagore available, Ray faced the challenge of making a film out of mainly static material, and he remarked that it took as much work as three feature films. In the same year, together with Subhas Mukhopadhyay and others, Ray was able to revive Sandesh, the children's magazine his grandfather once published. Ray had been saving money for some years now to make this possible. A duality in the name (Sandesh means both "news" in Bengali and also a sweet desert popular in Bengal) set the tone of the magazine (both educational and entertaining), and Ray soon found himself illustrating the magazine, and writing stories and essays for children. Writing became his major source of income in the years to come. In 1962, Ray directed Kanchenjungha, which was his first original screenplay and colour film. The film tells the story of an upper-class family spending an afternoon in Darjeeling, a picturesque hill town in West Bengal, where the family tries to engage their youngest daughter to a highly-paid engineer educated in London. The film was first conceived to take place in a large mansion, but Ray later decided to film it in the famous hill town, using the many shades of light and mist to reflect the tension in the drama. An amused Ray noted that while his script allowed shooting to be possible under any lighting conditions, a commercial film contingent present at the same time in Darjeeling failed to shoot a single shot as they only wanted to do so in sunshine. In 1964 Ray made Charulata (The Lonely Wife), the culmination of this period of work, and regarded by many critics as his most accomplished film. Based on Nastanirh, a short story of Tagore, the film tells the tale of a lonely wife, Charu, in 19th century Bengal, and her growing feelings for her brother in law, Amal. Often referred to as Ray's Mozartian masterpiece, Ray himself famously said the film contained least flaws among his work, and his only work, that given a chance, he would make exactly the same way. Madhabi Mukherjee's performance as Charu, and the work of both Subrata Mitra and Bansi Chandragupta in the film have been highly praised. Other films in this period include Mahanagar (The Big City), Teen Kanya (Three Daughters), Abhijan (The Expedition) and Kapurush o Mahapurush (The Coward and the Holy Man). In the post-Charulata period, Ray took on projects of increasing variety, ranging from fantasy to science fiction to detective films to historical drama. Ray also made considerable formal experimentation during this period, and also took closer notice to the contemporary issues of Indian life, responding to a perceived lack of these issues in his films. The first major film in this period is Nayak (The Hero), the story of a screen hero traveling in a train where he meets a young sympathetic female journalist. Starring Uttam Kumar and Sharmila Tagore, the film explores, in the twenty-four hours of the journey, the inner conflict of the apparently highly successful matinée idol. In spite of receiving a Critics prize in Berlin, the reaction to this film was generally muted. In 1967, Ray wrote a script for a film to be called The Alien, based on his short story Bankubabur Bandhu ("Banku Babu's Friend") which he wrote in 1962 for Sandesh, the Ray family magazine. The Alien had Columbia Pictures as producer for this planned U.S.-India co-production, and Peter Sellers and Marlon Brando as the leading actors. However, Ray was surprised to find that the script he had written had already been copyrighted and the fee appropriated by Mike Wilson. Wilson had initially approached Ray as an acquaintance of a mutual friend, Arthur C. Clarke, to represent him in Hollywood. The script Wilson had copyrighted was credited as Mike Wilson & Satyajit Ray, despite the fact that he only contributed a single word in it. Ray later stated that he never received a penny for the script. Brando later dropped out of the project, and though an attempt was made to replace him with James Coburn, Ray became disillusioned and returned to Kolkata. Columbia expressed interest in reviving the project several times in the 1970s and 1980s, but nothing came of it. When E.T. was released in 1982, Clarke and Ray saw similarities in the film to the earlier Alien script-Ray discussed the collapse of the project in a 1980 Sight & Sound feature, with further details revealed by Ray's biographer Andrew Robinson (in The Inner Eye, 1989). Ray believed that Spielberg's film would not have been possible without his script of The Alien being available throughout America in mimeographed copies (a charge Spielberg denies). In 1969, Ray made what would be commercially the most successful of his films. Based on a children's story written by his grandfather, Goopy Gyne Bagha Byne (The Adventures of Goopy and Bagha) is a musical fantasy. Goopy the singer and Bagha the drummer, equipped by three boons allowed by the King of Ghosts, set out on a fantastic journey in which they try to stop an impending war between two neighbouring kingdoms. Among his most expensive enterprises, it turned out to be very hard to finance; Ray abandoned his desire to shoot it in colour, turning down an offer that would have forced him to cast a certain Bollywood actor as the lead. Ray next made a film from a novel by the young poet and writer, Sunil Gangopadhyay. Featuring a musical structure acclaimed as even more complex than Charulata, Aranyer Din Ratri (Days and Nights in the Forest) traces four urban young men going to the forests for a vacation, trying to leave their petty urban existence behind. All but one of them get engaged into revealing encounters with women, which critics consider a revealing study of the Indian middle class. Ray cast Bombay-based actress Simi Garewal as a tribal woman, who was pleasantly surprised to find that Ray could envision someone as urban as her in that role. After Aranyer, Ray made a foray into contemporary Bengali reality, which was then in state of continuous flux due to the leftist Naxalite movement. He completed the so-called Calcutta trilogy: Pratidwandi (1970), Seemabaddha (1971), and Jana Aranya (1975), three films which were conceived separately, but whose thematic connections form a loose trilogy.Pratidwandi (The Adversary) is about an idealist young graduate; if disillusioned, still uncorrupted at the end of film, Jana Aranya (The Middleman) about how a young man gives in to the culture of corruption to make a living, and Seemabaddha (Company Limited) about an already successful man giving up morals for further gains. Of these, the first, Pratidwandi, uses an elliptical narrative style previously unseen in Ray films, such as scenes in negative, dream sequences and abrupt flashbacks. In the 1970s, Ray also adapted two of his popular stories as detective films. Though mainly targeted towards children and young adults, both Sonar Kella (The Golden Fortress) and Joy Baba Felunath (The Elephant God) found some critical following. Ray considered making a film on the Bangladesh Liberation War but later abandoned the idea, commenting that as a filmmaker he was more interested in the travails and journeys of the refugees and not politics. In 1977, Ray completed Shatranj Ke Khiladi (The Chess Players), an Urdu film based on a story by Munshi Premchand, set in Lucknow in the state of Oudh, a year before the Indian rebellion of 1857. A commentary on the circumstances that led to the colonization of India by the British, this was Ray's first feature film in a language other than Bengali. This is also his most expensive and star-studded film, featuring likes of Sanjeev Kumar, Saeed Jaffrey, Amjad Khan, Shabana Azmi, Victor Bannerjee and Richard Attenborough. Ray made a sequel to Goopy Gyne Bagha Byne in 1980, a somewhat overtly political Hirak Rajar Deshe (Kingdom of Diamonds) - where the kingdom of the evil Diamond King or Hirok Raj is an allusion to India during Indira Gandhi's emergency period. Along with his acclaimed short film Pikoo (Pikoo's Day) and hour long Hindi film Sadgati this was the culmination of his work in this period. In 1983, while working on Ghare Baire (Home and the World), Ray suffered a heart attack that would severely limit his output in the remaining 9 years of his life. Ghare Baire was completed in 1984 with the help of Ray's son (who would operate the camera from then on) because of his health condition. He wanted to film this Tagore novel on the dangers of fervent nationalism for a long time, and even wrote a (weak, by his own admission) script for it in the 1940s. In spite of rough patches due to his illness, the film did receive some critical acclaim, and it contained the first full-blown kiss in Ray's films. In 1987, he made a documentary on his father, Sukumar Ray. Ray's last three films, made after his recovery and with medical strictures in place, were shot mostly indoors, have a distinctive style. They are more verbose than his earlier films and are often regarded as inferior to his earlier body of work. The first, Ganashatru (An Enemy of the People) is an adaptation of the famous Ibsen play, and considered the weakest of the three. Ray recovered some of his form in his 1990 film Shakha Proshakha (Branches of the Tree). In it, an old man, who has lived a life of honesty, comes to learn of the corruption three of his sons indulge in with the final scene shows him finding solace only in the companionship of the fourth, uncorrupted but mentally ill son. After Shakha Prashakha, Ray's swan song Agantuk (The Stranger) is lighter in mood, but not in theme. A long lost uncle's sudden visit to his niece's house in Kolkata raises suspicion as to his motive and far-ranging questions about civilization. In 1992, Ray's health deteriorated due to heart complications. He was admitted to a hospital, and would never recover. An honorary Oscar was awarded to him weeks before his death, which he received in a gravely ill condition. He died on April 23, 1992. Satyajit Ray considered script-writing to be an integral part of direction. This is one reason why he initially refused to make a film in any language other than Bengali. In his two non-Bengali feature films, he wrote the script in English, which translators then interpreted in Hindi or Urdu under Ray's supervision. Ray's own eye for detail was matched by that of his art director Bansi Chandragupta, whose influence on the early Ray films were so important that Ray would always write scripts in English before creating a Bengali version, so that the non-Bengali Chandragupta would be able to read it. Camera work in Ray's early films garnered high regard for the craft of Subrata Mitra, whose (bitter) departure from Ray's crew, according to a number of critics, lowered the quality of cinematography in his films. Though Ray openly praised Mitra, his single-mindedness made him take over operation of the camera since Charulata, causing Mitra to stop working for Ray after 1966. Pioneering works of Subrata Mitra included development of "bounce lighting", a technique of bouncing light off cloth to create a diffused realistic light even on a set. Ray also acknowledged debt to Jean-Luc Godard and François Truffaut of the French New Wave for introducing new technical and cinematic innovations. Though Ray had a regular editor in Dulal Datta, he usually dictated the editing while Datta did the actual work. In fact, because of financial reasons and Ray's meticulous planning, his films were mostly cut "on the camera" (apart from Pather Panchali). At the beginning of his career, Ray worked with Indian classical musicians, including Ravi Shankar, Vilayat Khan and Ali Akbar Khan. However, the experience was painful for him as he found that their first loyalty was to musical traditions, and not to his film; also, his greater grasp of western classical forms, which he regarded as essential, especially for his films set in an urban milieu, stood in the way. This led him to compose his own scores starting from Teen Kanya. Ray used actors of diverse backgrounds, from famous film stars to people who have never seen a film (such as in Aparajito). Robin Wood and others have lauded him as the best director of children, pointing out memorable performances including Apu and Durga (Pather Panchali), Ratan (Postmaster) and Mukul (Sonar Kella). Depending on the talent or experience of the actor Ray's direction would vary from virtually nothing (actors like Utpal Dutt) to using the actor as "a puppet" (Subir Banerjee as young Apu or Sharmila Tagore as Aparna). According to actors working for Ray, his customary trust in the actors would occasionally be tempered by his ability to treat incompetence with "total contempt". Ray created two very popular characters in Bengali children's literature-Feluda, a sleuth, and Professor Shonku, a scientist. He also wrote short stories which were published as volumes of 12 stories, always with names playing on the word twelve (for example Eker pitthe dui, or literally "Two on top of one"). Ray's interest in puzzles and puns is reflected in his stories, Feluda often has to solve a puzzle to get to the bottom of a case. The Feluda stories are narrated by Topshe, his cousin, something of a Watson to Feluda's Holmes. The science fictions of Shonku are presented as a diary discovered after the scientist himself had mysteriously disappeared. Ray's short stories give full reign to his interest in the macabre, in suspense and other aspects that he avoided in film, making for an interesting psychological study. Most of his writings have now been translated into English, and are finding a new group of readers. Most of his screenplays have also been published in Bengali in the literary journal Eksan. Ray wrote his autobiography encompassing his childhood years, Jakhan Choto Chilam (1982) and essays on film: Our Films, Their Films (1976), along with Bishoy Chalachchitra (1976), Ekei Bole Shooting (1979). During the mid-1990s, Ray's film essays and an anthology of short stories were also published in the West. Our Films, Their Films is an anthology of film criticism by Ray. The book contains articles and personal journal excerpts. The book is presented in two sections-Ray first discusses Indian film, before turning his attention towards Hollywood and specific international filmmakers (Charlie Chaplin, Akira Kurosawa) and movements like Italian neorealism. His book Bishoy Chalachchitra was translated in 2006 as Speaking of Films, and contains a compact description of his philosophy of different aspects of the cinema. Ray also wrote a collection of nonsense verse named Today Bandha Ghorar Dim, which includes a translation of Lewis Carroll's "Jabberwocky". He also authored a collection of humorous stories of Mullah Nasiruddin in Bengali. Satyajit Ray designed four typefaces named Ray Roman, Ray Bizarre, Daphnis, and Holiday Script. Ray Roman and Ray Biazarre won an international competition in 1971. In certain circles of Kolkata, Ray continued to be known as an eminent graphic designer, well into his film career. Ray illustrated all his books and designed covers for them, as well as creating all publicity material for his films. He also designed covers of several books by other authors. Ray's work has been described as reverberating with humanism and universality, and of deceptive simplicity with deep underlying complexity. Superlative praise has often been heaped on his work by many, including Akira Kurosawa, who declared, "Not to have seen the cinema of Ray means existing in the world without seeing the sun or the moon. "But his detractors find his films glacially slow, moving like a "majestic snail." Some find his humanism simple-minded, and his work anti-modern and claim that they lack new modes of expression or experimentation found in works of Ray's contemporaries like Jean-Luc Godard. As Stanley Kauffman wrote, some critics believe that Ray "assumes [viewers] can be interested in a film that simply dwells in its characters, rather than one that imposes dramatic patterns on their lives." Ray himself commented that this slowness is something he can do nothing about. Kurosawa defended him by saying that Ray's films were not slow at all, "His work can be described as flowing composedly, like a big river". Critics have often compared Ray to artists in the cinema and other media, such as Anton Chekhov, Renoir, De Sica, Howard Hawks or Mozart. Shakespeare has also been invoked, for example by the writer V. S. Naipaul, who compared a scene in Shatranj Ki Khiladi to a Shakespearian play, as "only three hundred words are spoken but goodness! - terrific things happen." It is generally acknowledged, even by those who were not impressed by the aesthetics of Ray's films, that he was virtually peerless in that his films encompass a whole culture with all its nuances, a sentiment expressed in Ray's obituary in The Independent, which exclaimed, "Who else can compete?" Early in 1980, Ray was openly criticized by an Indian M.P. and former actress Nargis Dutt, who accused Ray of "exporting poverty," demanding he make films to represent "Modern India." On the other hand, a common accusation levelled against him by advocates of socialism across India was that he was not "committed" to the cause of the nation's downtrodden classes, with some commentators accusing Ray of glorifying poverty in Pather Panchali and Asani Sanket through lyricism and aesthetics. They also accused him of providing no solution to conflicts in the stories, and being unable to overcome his bourgeoisie background. Agitations during the naxalite movements in the 1970s once came close to causing physical harm to his son, Sandip. In a public debate during the 1960s, Ray and the openly Marxist filmmaker Mrinal Sen engaged in an argument. Sen criticized him for casting a matinée idol like Uttam Kumar, which he considered a compromise, while Ray shot back by saying that Sen only attacks "easy targets", i.e. the Bengali middle-classes. His private life was never a subject of media scrutiny. Ray with his Academy Award just days before his death. Satyajit Ray is a cultural icon in India and in Bengali communities worldwide. Following his death, the city of Kolkata came to a virtual standstill, as hundreds of thousands of people gathered around his house to pay him their last respects. Satyajit Ray's influence has been widespread and deep in Bengali cinema, a number of Bengali directors including Aparna Sen, Rituparno Ghosh and Gautam Ghose in India, and Tareq Masud and Tanvir Mokammel in Bangladesh, have been influenced by his film craft. Across the spectrum, filmmakers such as Budhdhadeb Dasgupta, Mrinal Sen and Adoor Gopalakrishnan have acknowledged his seminal contribution to Indian cinema. Beyond India, filmmakers such as Martin Scorsese, James Ivory, Abbas Kiarostami and Elia Kazan have been influenced by his cinematic style. Ira Sachs's 2005 work Forty Shades of Blue was a loose remake of Charulata, and in the 1995 film My Family, the final scene is duplicated from the final scene of Apur Sansar. Similar references to Ray films are found, for example, in recent works such as Sacred Evil, the Elements trilogy of Deepa Mehta and even in films of Jean-Luc Godard. The character Apu Nahasapeemapetilon in the American animated television series The Simpsons was named in homage to Ray's popular character from The Apu Trilogy. Ray along with Madhabi Mukherjee, was the first Indian film personality to feature in a foreign stamp (Dominica). Many literary works include references to Ray or his work, including Saul Bellow's Herzog and J. M. Coetzee's Youth. Salman Rushdie's Haroun and the Sea of Stories contains fish characters named Goopy and Bagha, a tribute to Ray's fantasy film. In 1993, UC Santa Cruz established the Satyajit Ray Film and Study collection, and in 1995, the Government of India set up Satyajit Ray Film and Television Institute for studies related to film. In 2007, British Broadcasting Corporation declared that two Feluda stories would be made into radio programs. During the London film festival, a regular "Satyajit Ray Award" is given to first-time feature director whose film best captures "the artistry, compassion and humanity of Ray's vision". Wes Anderson has claimed Ray as an influence on his work; his most recent film, The Darjeeling Limited, set in India, is dedicated to Ray. Numerous awards were bestowed on Ray throughout his lifetime, including 32 National Film Awards by the Government of India. When Ray was awarded honorary doctorates by Oxford University, he was the second film personality to be so honored after Chaplin.. He was awarded the Legion of Honor by the President of France in 1987 and the Dadasaheb Phalke Award in 1985. The Government of India awarded him the highest civilian honour Bharat Ratna shortly before his death. The Academy of Motion Picture Arts and Sciences awarded Ray an honorary Oscar in 1992 for Lifetime Achievement. In 1992 he was posthumously awarded the Akira Kurosawa Award for Lifetime Achievement in Directing at the San Francisco International Film Festival; it was accepted on his behalf by actress Sharmila Tagore. 14. ^ "Filmi Funda Pather Panchali (1955)", The Telegraph, 2005-04-20. Retrieved on 2006-04-29. 16. ^ Malcolm D. Satyajit Ray: The Music Room. guardian.co.uk. Retrieved on 2006-06-19. 21. ^ Palopoli S. Ghost 'World'. metroactive.com. Retrieved on 2006-06-19. 26. ^ Antani J. Charulata. Slant magazine. Retrieved on 2006-06-19. 28. ^ a b Ray, Satyajit. Ordeals of the Alien. The Unmade Ray. Satyajit Ray Society. Retrieved on 2008-04-21. 29. ^ Neumann P. Biography for Satyajit Ray. Internet Movie Database Inc. Retrieved on 2006-04-29. 30. ^ Newman J. "Satyajit Ray Collection receives Packard grant and lecture endowment", UC Santa Cruz Currents online, 2001-09-17. Retrieved on 2006-04-29. 43. ^ Sen A. Western Influences on Satyajit Ray. Parabaas. Retrieved on 2006-04-29. 49. ^ Datta, Sudipta. "The Ray show goes on", The Financial Express, Indian Express Newspapers (Mumbai) Ltd, 19 January 2008. Retrieved on 2008-04-10. 52. ^ Malcolm D. The universe in his backyard. guardian.co.uk. Retrieved on 2007-02-15. 53. ^ Swagrow M. An Art Wedded to Truth. The Atlantic Monthly. Retrieved on 2007-02-15. 60. ^ Ebert R. The Music Room (1958). suntimes.com. Retrieved on 2006-04-29. 66. ^ Tankha, Madhur. "Returning to the classics of Ray", The Hindu, 1 December 2007. Retrieved on 2008-05-01. 67. ^ Amitav Ghosh. Satyajit Ray. Doom Online. Retrieved on 2006-06-19. 68. ^ Mrinal Sen. Our lives, their lives. Little Magazine. Retrieved on 2006-06-29. 69. ^ Chris Ingui. Martin Scorsese hits DC, hangs with the Hachet. Hatchet. Retrieved on 2006-06-29. 70. ^ Sheldon Hall. Ivory, James (1928-). Screen Online. Retrieved on 2007-02-12. 71. ^ SK Jha. Sacred Ray. Telegraph India. Retrieved on 2006-06-29. 72. ^ André Habib. Before and After: Origins and Death in the Work of Jean-Luc Godard. Senses of Cinema. Retrieved on 2006-06-29. 73. ^ Datta S. Feluda goes global, via radio. Financial Express. Retrieved on 2007-02-12. 75. ^ a b Personal Awards. Awards. satyajitray.org. Retrieved on 2008-04-09. 76. ^ Awards and Tributes: Satyajit Ray. San Francisco International Film Festival: The First to Fifty. San Francisco Film Society. Retrieved on 2008-04-08.